My dad was one of those men who didn't just play at something. If he was going to try a sport or hobby, he went all in by ordering magazines, self help books, and watching professionals when he could. I was born in Dallas while he was in the seminary, and occasionally he was able to golf near downtown. He told me about a man with a Mexican accent helping him on the driving range one day, and he later found out it was Lee Trevino. I think that encounter set him off on the pursuit of excellence. In the fourth grade, I was big enough to choke up on a golf club and chip around our two acre yard. I would watch my reflection in our sliding glass doors while swinging the club in the back yard, and I could mimic the swing I would see on TV when Dad was watching Nicholas or Watson battling it out. It wasn't long until he thought he could take me to the links as a playing partner. I remember the first time my 7 iron hit it 150 yards straight at the pin and rolled up 2 inches in front of the cup on a par three. There wasn't a better feeling in the world! Then, on the next hole, I shanked the same 7 iron and watched the ball head to the lake. "OH MY GOSH!" and other expletives would be uttered. I might even pound that club on the ground a few times. Soon, however, I was playing on the high school golf team and studying the sport like my dad did. I even helped others on the team with their “swinnngg.” I would repeat some of the same things I heard as a boy from my dad - if I learned, so could they. I remember the decision when I was about 20 years old - art or golf. I could have gone down either path (so I thought) but chose the one that made me the happiest. Golf was one of those things I knew I could do, but it was extremely frustrating trying to accomplish it. After punting my driver about 20 yards down the fairway one day as a big slice was flying over to the next hole's fairway, I knew this game wasn’t for me. I would chose art and just relish the "Dreams of Green" that I could see in my mind as that great shot would head to the hole right on the stick. "Back up baby!" Yes, it was all in my mind what I couldn't make happen consistently on the links. That day, I shot a 33 on the front nine (3 under par), and I was heading in on the 18th about to score a 43 (7 over par). Yes, sir, it was going to be art for me. So, 35 years later when I set off to paint a golf painting, I remembered this golf course and watching the game with my dad many years ago. It was so beautifully manicured and not like our public course in Lufkin, TX. This one was immaculate, and the winner of the tournament would receive a green jacket with a large cash prize. 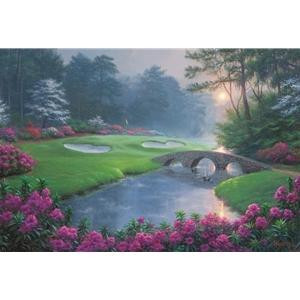 I imagined this as the morning of the final round - mist rising on the water, the grounds keepers finishing their perfection, and the crowds coming soon. On this day, everyone would have "Dreams of Green."